What is WCF? How to create WCF in ASP.NET? In this article I am going to explain about what is WCF and how to create WCF in ASP.NET basic example program. Through this article learn about WCF basic and integrate WCF services in ASP.NET . WCF expansion is Windows communication Foundation, It is a service oriented technology. WCF is a advanced future of Web service. It is created with four major features i.e. WCF is combined with Web service, Remoting, MSMQ and COMT concept. 1) Compared to Web service WCF support more protocols like TCP/IP, PIPE, MSMQ, HTTP. No need to write separate code for each protocol just adding endpoint for each protocol it's enough. 2) WCF is more secured and reliable compare to web service. 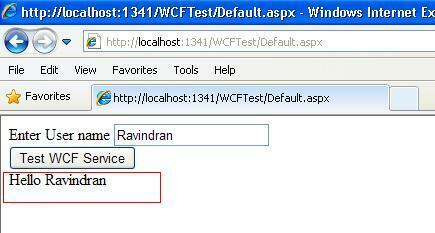 4) WCF can be hosted on IIS, WAS, Self hosting, Windows services too. What is Endpoint in WCF? 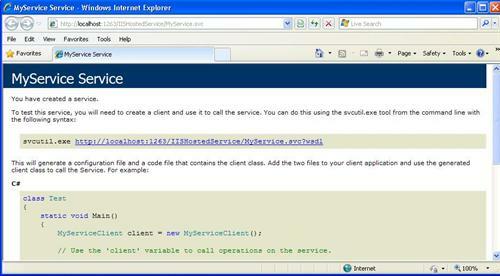 EndPoint is denoted as how to communicate with WCF service in ASP.NET. It mean which protocol are used to access WCF service etc. If user want access WCF service is more that protocol then add those protocols and details in the web.config file endpoint under services tag. It is used to denoted where our WCF service is hosted, user can use this URL to call our web service. Contract is used to mention WCF Interface name to user know about that. How to create first WCF application? Service contracts is defined as a operation that service can provide. Service contract created with interface. OperationContract is used to defined which methods are performed in the WCF etc. In this example I am going to use HelloWorld method and return as string. Right click on the project name in the solution explorer and choose "Add Web Reference" then put above WCF service endpoint URL to call WCF service method and variables. &LT;asp:Button ID="Button1" runat="server" Text="Test WCF Service"
I hope this code snippet is help you to know about basic of WCF Service. How we can say WCF is secured one in comparision with Web Services/ any? OR How we can give security to WCF Application?